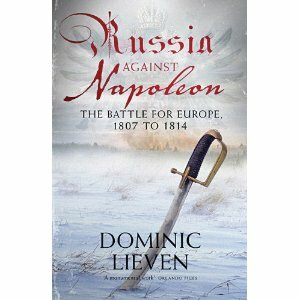 The latest book finished from the growing stack from my bedside table is Russia Against Napoleon by Dominic Lieven, a special request review for Jim. Well, Jim here it is! As you may have noticed from the title of this blog and the figures in my collection, I focus mainly on the Peninsula War in particular, and the Napoleonic Wars between 1808-1812 in general, so I'm not altogether familiar with the later massive campaigns of the period 1812-1814, especially from the Allied point of view. This book was a really good entree into the military and political realities faced by the Russians in the period post-Austerlitz and the Allies after the French disaster of 1812. The author sets out to repair the damage inflicted on popular perceptions of the 1812 campaign by Leo Tolstoy's magnum opus War & Peace. General Winter gets more credit for defeating the French than any historical figure in Tolstoy's fictional account. Tolstoy was writing in the wake of the Crimean War where criticism of Russian leadership was justified, but Lieven sets out to correct the misconception that has become almost accepted fact. Napoleon's excuses that he was beaten by the weather and not by the Russian army has also gone a long way to muddying the waters of the truth of the Russian campaign as well. Lieven takes the battles of Eylau and Friedland as the starting point of this epic and ends with the first abdication of Napoleon in 1814. He pops some historical bubbles along the way such as Emperor Alexander's infatuation with Napoleon after their meeting at Tilsit in 1809. The author makes the case that Alexander was just as good an actor as Napoleon, possibly even more so; Although Alexander was an autocrat, he needed to be a skilled manipulator of men in order to keep his throne as his father's demise at the hands of aristocratic assassins showed. The author's argument that he used his man-management skills on Napoleon rings true as his behaviour towards Napoleon cooled very suddenly after the Tilsit meeting. Lieven instead argues that Alexander was a lot more far sighted than he was given credit for; he knew that any peace with Napoleon was temporary as it was not in Russia's interests to have French forces on the western border. Also, he knew that peace with Napoleon was not in his own personal interest as the majority of the nobility were against it ans if he wanted to keep his throne he needed to appease these nobles. Mostly, however, the overriding argument for abandoning peace was the damage that acceding to the Continental System was doing to the Russian economy. All these factors made the resumption of war inevitable, as both sides quickly came to realise; it was just a matter of who blinked first. Napoleon was only interested in fighting a limited war against Russia to bring her to heel, but Alexander was far-sighted enough to know that any war would have to be a war to the finish if the threat to Russia posed by Napoleon was to be ended. Alexander's far-sightedness required him to drag a considerable number of generals and politicians along with him due to their reluctance to do more than expel Napoleon from Russian territory. Kutuzov was one in particular who wasn't interested in liberating Europe. Even though war was predicted, Russia was far from prepared for it when it did come. The Russian army was in the middle of restructuring and reorganisation led by the able administrator Barclay de Tolly when the Grande Armee invaded. The plan was to lure the French deep into the interior, wearing them down, stretching their communications, and smash them against prepared positions in the interior. The problem was that the French advanced too rapidly and the site chosen for the prepared position turned out to be impractical. The only other choice was to retreat further. Although there was much consternation at retreating in the face of the enemy, the reality was that the Russian lines of supply were shortening while the French lines were stretched to breaking point. While the Battle of Borodino could be seen as a tactical French victory, strategically it was a Russian victory basically because the Russian army still existed. The chapters on logistics and recruiting show how badly Napoleon had misjudged his chances of success. Like Hitler in the 20th C, initial success gave way after the first winter to the overwhelming surge of manpower available to the Russians. Although it was nowhere near as densely populated as most of Western Europe, Russia still had reserves to draw on that would have made Napoleon weep if he had a true grasp on the numbers. Conscription was no problem as the soldiers came from the serf population. What was different in this war was that a large proportion came from state owned serfs, rather than just from those who belonged to the nobility. This was necessary to keep Russia from starving. While you'd think that conscription in an authoritarian state would be a simple matter of tapping a peasant on the shoulder and saying 'You're a soldier now, tovarisch', the process was quite a bit more sensitive and nuanced than that; Families with only one bread-winner were exempted with the burden falling on those larger families with more younger men who could be spared. Of course there were the exceptions to this rule with corruption and the desire to rid communities of troublemakers not unknown, but the general process was surprisingly fair. Getting these recruits to the depots and training them and then getting them to the frontline was a task of epic proportions in itself, especially once the fighting left Russian soil; Recruits could travel over 1500 miles before they reached their parent units! The whole process of feeding, clothing and supplying the frontline forces with ammunition, recruits and horses is just a story of heroically overcoming every obstacle that deserves to be remembered as much as the battles and generals do. The French lost because their logistics just weren't up to the task, while the Russians won because theirs were. Then comes the chapters on the 1813-14 campaigns which focus on the diplomatic wranglings Alexander was forced to undertake to forge a coalition to take Germany back from the Napoleon. It is a mark of his personal touch and indomitable spirit that he virtually single-handedly carried the heads of Prussia, Sweden and Austria along with him into an anti-French alliance and kept them all focused on the goal of defeating the French and ultimately, of getting rid of Napoleon from the French throne. The descriptions of the massive battles fought during these campaigns are mind-blowing; the numbers of men involved weren't seen again until WW1. Before motorised transport, radio communication, modern medical knowledge etc., etc. these battles must have been hell on earth, even though all other battles up til then were hardly walks in the park. A thoroughly enjoyable read from which I learned a great deal. This one earns 2 Rosbif thumbs up! Really is a great book with a refreshing new view about the Napoleonic struggle! Thank for info Rosbif !!!! Thank you for the fine book report. It is another demonstration of the how 'myths' created around many historical events that are perpetuated from one generation to the next. I will have to add this book to the reading list before Jim Battle of Borodino in January 2014. Perhaps I should have re-read it before I posted it. Please excuse the poor grammar and forgetting to add 's after Jim. Mmm...a single volume on the Russian contribution, interesting. I might look that up. My Napoleonic library is almost all Peninsula, I rarely bother with this Continental nonsense. I've nominated you for the Stylish Blogger Award. 1) provide a link back to the nominating blogger and his/her blog. 2) Tell us seven things about yourself. 3) Nominate another blog/blogger (or several) for the award. Or cultivate a patrician disdain, both are acceptable courses of action.